The updated Nissan Leaf is launching now in Europe. It comes with many small improvements but it takes sharp eyes to distinguish the new Leaf from the old. What most people are more likely to notice is that it’s now possible to buy the car without buying the battery, because that unit can be leased. In France, that makes the car €5,900 cheaper ($7,721), but the customer will have to add the monthly rent for the battery which is between €79 and €142 depending on contract length and mileage ($103 to $186). This rent will be due indefinitely. So the lower buying price may sounds good at first, but it may not be as rosy in the long run. With battery included and without the government incentive, prices start at €30,190 for the base model, and go up to €35,590 for the top Tekna model with 17′ alloys, a strong Bose stereo and leather. 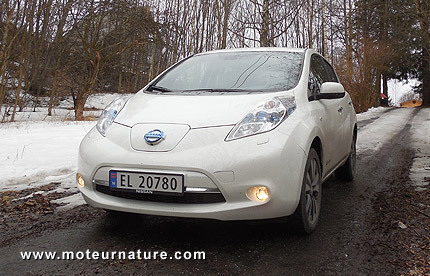 We bet sales will increase, even in Norway, where the Leaf has been a huge success so far. Thanks to an EV-friendly policy, the electric Leaf was the 13th best selling model in Norway last year. It went up to the sixth position in the first quarter this year, beating the Ford Focus! And these figures are for the gas model. Electric Focus is not yet available in Europe. Norwegians can buy a gas or a diesel Focus, but they’d rather get an electric Leaf. Thank you. I guess Ford should speed up the launch of its electric Focus in Norway.